The friction produced by winds blowing towards the equator on the ocean's surface, together with the effect of the earth's rotation, cause water in the surface layer to move away from the western coast of continental land masses. This offshore moving water is replaced by water which upwells, or flows toward the surface from depths of 50 to 100 meters and more. 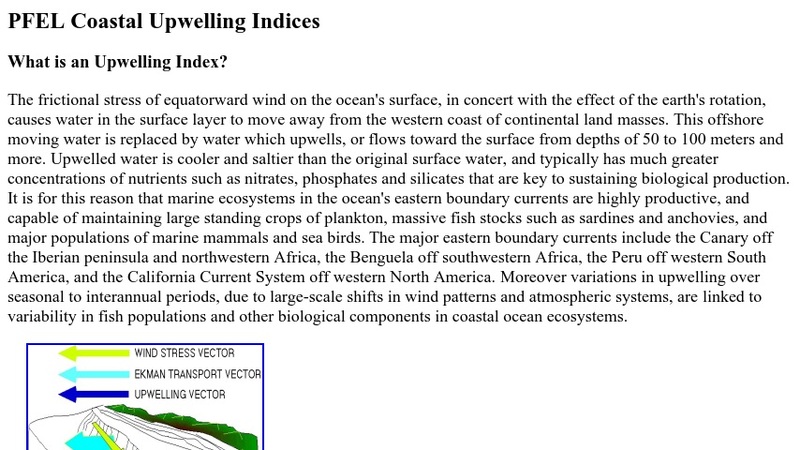 Users can view an illustration and read an explanation of how coastal upwelling works and why it results in the occurrence of highly productive marine ecosystems in areas of upwelling.